Here is a little bit about me…I DO NOT KNOW HOW TO COOK whatsoever, I can bake but not cook. My skills in cooking contains how to make ice, instant noodles and miso udon. Hey it’s Christy here introducing a new segment within THE LIFE! This new segment is going to consist of challenges to help us achieve our goal and to try something new to potentially improve our daily lives. So, my goal is to challenge myself to cook dinner for 5 days straight and hopefully by the end of this, I will at least know the basics of cooking. To begin my challenge, I would need to plan what to buy and cook for the next 5 days. I have spent countless of hours scrolling through Pinterest for recipes, but I have only narrowed down to 3 recipes and I'll decide the last 2 meals later when I’m at the supermarket... That ended up as a fail on my part because I was running around the supermarket on my phone speed scrolling on Pinterest to find a simple recipe. Overall my grocery shopping was confusing. Choosing ingredients was hard for me because I didn’t know how to pick the freshest produce, but I had help from my mom which made the process smoother. After buying all the ingredients, I got home to start marinated the chicken for the next 2 dinners. When marinating the chicken, I added pepper and chicken mix powder that my family swears by to make everything tasty. To tie everything together, I added a little bit of Cognac to add taste, you know a meal is fancy when alcohol is involved (Christy’s logic). Meanwhile I chopped the onions, ginger, garlic and tomatoes and set it aside for Monday. To start it the challenge off, I wanted to pick something that was easy and fast to cook so I decided to cook Japanese curry. To my knowledge Japanese curry was just popping the box curry cube, adding hot water, chicken and calling it a day. WRONG. There was a lot of seasoning to add into the curry to bring it taste and make the flavour richer. In order to enrich the curry, I added curry powder and a little bit of sugar since Japanese curry is meant to be a bit on the sweeter side. After the curry is good to go, I mixed the potatoes, carrots and chicken in the pot. Overall experience, it was a lot of work to perfect the taste of the curry and it took longer than I expected. TIP: Set the chicken earlier to room temperature before cooking so the chicken can cook a lot faster. What drove me to this second Pinterest recipe was that it said it would take less than 15 minutes to make. My motivation of each recipe was how quickly I can whip up a meal. The recipe was lemon rice and chicken. I love experimenting when it comes to food, adding random spices and twisting the recipe into my own. So when I found this recipe the first thing I thought of was adding my family’s favourite seasoning which was this blue can vegetable mix. A little of this seasoning makes everything taste better. When making the rice, I added 1 spoon of the mix with the lemon and let it sit before cooking the rice in the rice cooker. Meanwhile it sits, I started to cook the chicken with adding Italian herbs to make it fancy. After it’s 60% cooked, I threw in the chicken in the rice cooker and let everything cook together for 15 minutes. Overall, the recipe lied. The meal took longer than 15 minutes but it was really good and worth it. What I can learn for next time is to calm down with the lemons since the rice was a bit too sour. Note to myself make rice not sour lemonade. The third day was the most challenging day of them all because I had to balance my work schedule to have enough time to cook. I got off work very late that night and I didn't have the time to cook. For the last 2 days, I had adult supervision guiding me every step of the way so I won’t burn down the kitchen. On day 3, I cooked and prepared everything myself, which surprised me because from all the recipes I chose a healthy one. The third recipe was Soba Salad with Peanut Sauce, it was pretty easy to make but the peanut sauce took a while in order to get the consistency right (trying to make my sauce sound hard to make). I really winged the recipe a lot because of the missing ingredients I forgot to purchase. To start off with the sauce I added peanut butter, sesame oil, soy sauce, garlic, honey and balsamic vinegar. The last ingredient sounds way off because it is. The recipe asks for rice vinegar but unfortunately, I forgot to pick it up at the grocery store so I used the closest alternative I could find which was balsamic vinegar. To finish off the sauce I added a little lime hot sauce to enhance the sauce with a bit of spiciness and zing. The challenge is almost coming to an end and I find myself going towards the lazy girl cooking style like buying precooked packaged udon and premade stir fry sauce. That leads us to the forth meal which was stir fry udon with shrimp. In the beginning I planned to make seasoned shrimp with asparagus but turned out asparagus is a bit hard to prepare and takes a lot of time. So, I switched to broccoli instead which lead to adding udon to mix in together. I would never have thought of buying packed udon until my mom showed me the ways of cooking really fast. This way is probably not healthy at all but it was fast and easy - just how I like it. 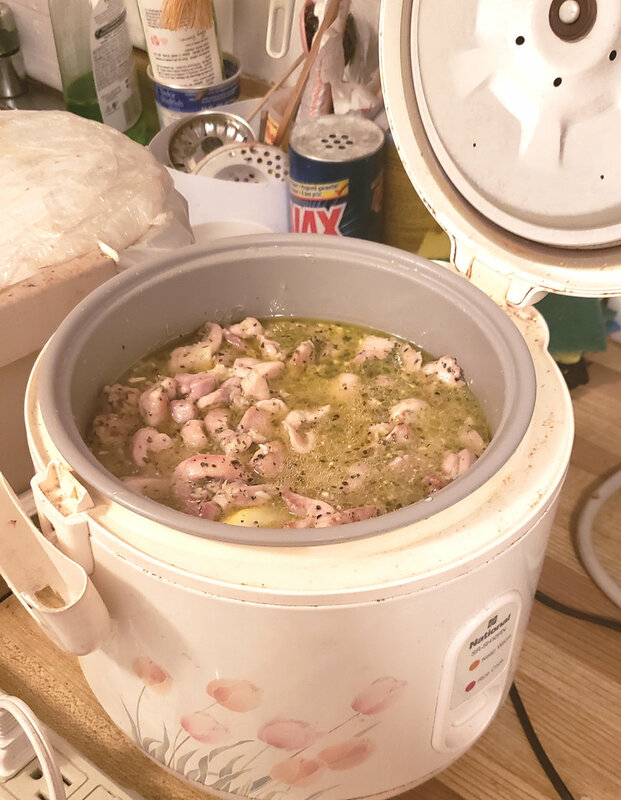 One thing that I could have improved on was not cooking the shrimp all the way through or else the shrimp is going to be overcooked when mixing and stirring the noodles in the pan. Left overs were starting to pile up in my fridge and this challenge is going to leave me with days worth of lunches after this is all over. Finally for the last meal of the challenge, I was planning to finish off with a bang, such as steak or chicken, but I realized I’m not as pro as I think and I can't master that just yet. I have decided to finish this challenge with some typical Chinese home cooked meal my mom would always make for me. Last day was actually a disaster, I went to the supermarket the day before to buy fish paste to make fried fish paste cake. Turned out the packaging expiry date lied to me and it was spoiled. While I was cooking the paste, it got very messy and had to throw out the entire fish cake which definitely broke my heart. At the end, I went with soy sauce mushrooms and cauliflowers with steamed egg. Steamed egg is also my favourite so I was satisfied either way. In Day 2, I mentioned how my family loves the blue canned vegetable mix because it makes everything taste good, so I added a spoonful of that in the egg and turned out very well. This concludes my 5 day cooking challenge and it finished off with adding another dish to my left-over collection in my fridge. Overall, this experience was fun since I got to cook with my mom which changed her mind about cooking more home cooked meals. It was a lot of work putting everything together and shopping for groceries but at the end it was worth it when the meal turns out to be very tasty and not sad like my fish cake that I had to throw out. If you have anything you want to try and challenge yourself definitely do it, limiting yourself to a short period time doesn’t seem much of a commitment and hassle. You might even start liking it and change your whole perspective of things. This is the end of my journey thanks for reading. Love, Christy.